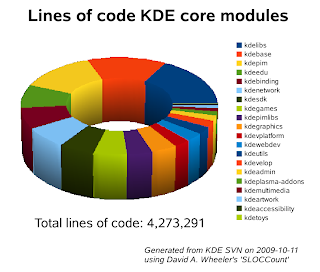 4,273,291 lines of code, that's the size of the KDE core modules, which are released as the official KDE software distribution, as of today, the numbers generated using David A. Wheeler's SLOCCount. Of course we all know about the problems with counting lines of code, but I still find it interesting to run these statistics from time to time. I was doing so tonight, and thought, when I do so, I can just as well share the data with the world. Please see this as an interesting but not too significant data point about what's going in KDE, and don't forget that removing code is one of the finest tasks of a developer. Of course these four million lines of code are only a part of all the KDE code that is written. There are tons of applications which are not part of the standard KDE distribution, but are just as great. Would be interesting to do the complete statistics, but this is hard. How to get hold of all KDE source code which exists? Concluding random data point: SLOCCount thinks that it costs $ 175,364,716 to develop the code of the KDE core modules. Well, at least you have small codebase when compared to quality and the features what KDE posses. And when compared to Linux OS codebase, over 11 million lines. KDE is small and feature rich, even the user only typically see KDE. But lets not compare the features of the OS and the desktop environment. Both are as important to normal user. Of course KOffice is missed - it is not part of the core KDE release - Amarok, k3b, Konvi, Digikam and others are also missed. If we include everything that we consider 'KDE', we're probably even higher. KDE 3.5 WAS THE BEST LINUX DESKTOP. TOO BAD THEY DESTROYED IT WITH THE BROKEN MESS THAT IS KDE 4. BUT, KDE 4 IS GETTING BETTER AND GNOME IS SO RETARDED IT'S A JOKE. They also missed otu qt, which is another 16 million LOC. Quite reasonable to do so, though.